The team of teachers in the Den Bosch schools has grown, and there were about 30 teachers in attendance for the annual Neohumanist Education Teachers Training in March. This year, the teachers had expressed the desire to deepen their inner growth and thus the focus of much of the training was on personal development and spirituality. When the first session opened with a kiirtan, several of the teachers described a welcome feeling of coming “home” again to themselves – remembering the nice feeling that had been created in the previous year’s training. Indeed, each year a greater sense of unity has been growing and many of the teachers have been taking their personal journey of development quite seriously. As Neohumanist education puts a great emphasis on the key role of the teacher’s rich inner life it is a great achievement for a school to create an atmosphere that facilitates and nurtures this process. Indeed, by the end, some of the teachers were expressing that they are ready for more advanced topics, which again is a positive sign that demonstrates the maturity of the team. 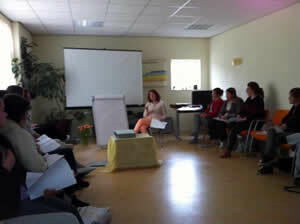 Following the training, the teachers decided on their own initiative to start a short collective meditation session during the lunch break, and several teachers have felt that it has helped them in their personal development as well as creating a positive, supportive feeling in the school community.